I’ve been writing about the time my husband got me a one day gig as an extra on That Thing You Do. Released in 1996, it was the first feature film Tom Hanks directed. This is Part Four of Five. You can catch up here or just read the one. Okay. Okay. So I wasn’t going to get my makeup done by a professional makeup artist and morph magically into a movie star. No surprise really, I’d always be more MaryAnne than Ginger. 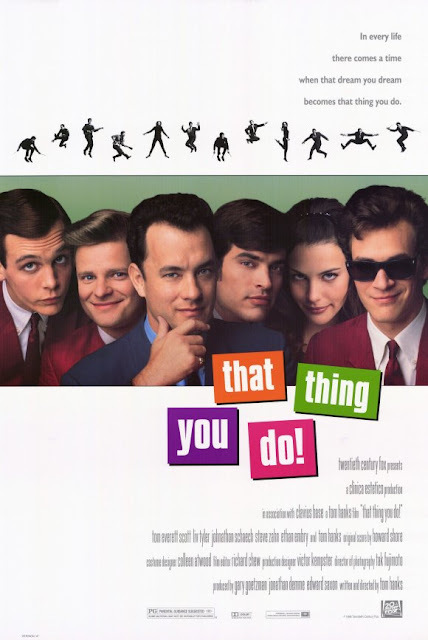 Reality checked, I settled down to enjoy the day and the experience of being an extra—pardon me, a background actor—on the set of That Thing You Do, the movie my husband was working on at the time. It was a beautiful crisp autumn morning in the Southern California town of Orange, and while it was 1995 in the real world, I could easily see the small old-fashioned looking town passing for early summer in Erie, Pennsylvania, circa 1964, in the reel world. It was perfect weather for walking up and down the street, holding onto my son’s hand, as if we were out running errands and doing some shopping. My little boy, with his penchant for wearing capes, loved every moment, changing into his wardrobe was like he was playing dress-up. Pretending to be shopping was just another game of make-believe. Being on a movie set was right in his wheel-house, he was conceived on location and practically born with a camera in his face and a walkie talkie in his hand. Because my husband had the job of setting the background, which meant putting the extras in logical little clusters, telling them where to walk and giving them a mini backstory and a little bit of business to help keep it real, we saw him much of the morning out there on the sidewalk. ‘You three are shopping for prom dresses,’ I heard him say to a group of giggling teenage girls, clearly as in awe of him as if he were Tom Hanks himself, ‘when you hear Action, walk over to this store and look in the window until Ethan passes by, then count to three and start walking again.’ Then he zoomed over and to where Russell and I were waiting for our cue and gave us both a quick hug. ‘Silly daddy!’ I said laughing, when he left, embarrassed at the curious looks from the other extras. As if our not-quite-three-year-old even knew what a raise was. as if I were beautiful. It was an embarrassment I felt even more acutely at lunchtime when my husband pulled us out of the extra’s line and brought us to eat with the rest of the cast and crew. It was that same little thrill you feel at being pulled out of line and shepherded into a nightclub while the other girls waited restlessly, a little resentfully. Giddy. Proud. But awful too. That’s not fair, the other girls in line grumbled. Like you grumbled when you were the one left behind in line. That’s not fair, I could see the looks on the faces of the other extras. The real extras. Eating with the cast and crew meant having grilled swordfish, saffron rice, broiled chicken, veggie pasta, caesar salad, cherry pie, three flavors of ice cream and four different kinds of cake. We didn’t have to choose; chicken or beef, rice or potatoes. It was like a deluxe buffet and if we’d wanted, we could have it all. The extras were eating pasta with marinara sauce, salad, rolls and dessert. It was a perfectly fine meal. As required, they were being fed. But it wasn’t what you’d call equal treatment. It wasn’t fair. After lunch we slunk back in to extra’s holding feeling like impostors. The guilt of the entitled class. Being an extra can be a good gig if don’t mind being invisible. If you’re not using it to jump to stardom. If you don’t mind the hurry up and wait mentality of movie making. Being an extra usually means you’re filling out the empty spaces in the background of the shot, giving a scene depth and life while the main action takes place with the actors in the foreground. Like the crowd sitting next to Sandra Bullock at the football game in The Blind Side or the club-goers that Rollergirl skates around in that famous opening shot of Boogie Nights. You have to have people there, football fans and nightclub patrons, but nobody’s looking at them. They’re background. Living, breathing set decorations. Then there’s what we used to call ‘featured extras’. A step above your basic crowd scene fillers, a featured extra would be seen by the camera. Not for long and you didn’t have lines but you stood out a bit from the crowd. You really were in the movie. Your friends would see you. After lunch, Russell and I became featured extras. It had nothing to do with talent; it had everything to do with being there and knowing the right people. We’d just come back from the bathroom—thank God he was well and truly toilet-trained—and I’d freshened my makeup (the makeup I’d applied myself) and found the woman with the red lipstick, when I saw my husband rushing into the holding area, heading our way. As usual he was accosted by extras with a slew of questions and complaints—they’d been sitting there all day, when were they going to be called? could they get a better pair of shoes, these were killing their feet? when was wrap? who had the vouchers? were they being called back tomorrow? Fending them off with his good-humored answers (soon—I’ll check with wardrobe—what? you got someplace to go?—talk to Jerry —not sure yet) he started gathering up my things. I’d almost stopped hyperventilating by the time we reached the set. There was Tom Hanks, standing by the camera. My husband turned us over to the first A.D. and disappeared. Breathe, I had to remind myself one more time. We were ready for our close-up, Mr. Hanks. For real, this time.